Birth defects and reproductive and developmentally-mediated disorders constitute a major public health concern in the world today. Human development can be affected not only by drugs and chemicals but also by diet, genetics, maternal health, and socioeconomic factors. The Teratology Society strives to understand and protect against potential hazards to developing embryos, fetuses, children, and adults by bringing together scientific knowledge from diverse fields. The Teratology Society CME Program is a four-day CME program offering information on new approaches for the treatment of birth defects. Identify the major air pollutants associated with developmental toxicity, their primary health effects, potential mechanisms of action, and define factors associated with increased susceptibility. State how 3D in vitro assays can be synthetically engineered from human cells and biological matrices to generate cutting-edge research platforms. 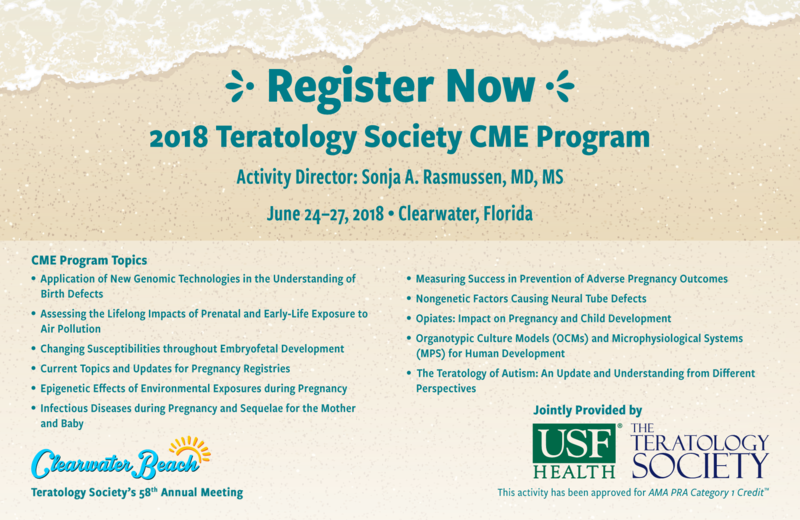 Registration for the 2018 Teratology Society CME Programis $35 and is open to all registrants of the Teratology Society 2018 Annual Meeting. Contact tshq@teratology.org for more information about registering for the 2018 Teratology Society CME Program. CME Registration Fees include participation in the CME Program and CME Certificate upon completion of required survey. Cancellations must be requested in writing via fax to 703.438.3113 or e-mail to tshq@teratology.org, and received by May 15, 2018 in order to receive a refund. There are no refunds for no-shows or for cancellations received after May 15, 2018. USF Health designates this live activity for a maximum of 15.50 AMA PRA Category 1 Credits™. Physicians should claim only the credit commensurate with the extent of their participation in the activity. USF is an Equal Opportunity / Affirmative Action / Equal Access Institution. For disability accommodations, contact Amy Wills at awillis@teratology.org, no later than May 30, 2018. If you have activity or credit questions or concerns, please contact Becca Isakower at 703.438.3104 or bisakower@teratology.org.